Are sweet treats killing your kids? Then you’ll definitely want to keep them away from the White Chocolate Edition Kill Kat vinyl figure by Andrew Bell! 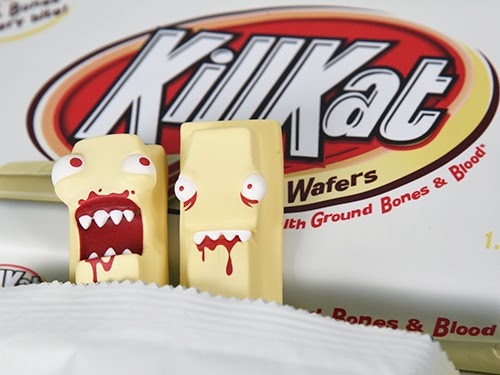 This limited edition Kill Kat colorway is rumored to be covered in ground bones and filled with tasty blood. Wonder where it all came from? Now with 5% more bones in every bite. Don’t worry, they’re organic! The Ground Bones and Blood (aka White Chocolate) Edition Kill Kat stands 6” tall and comes in a candy wrapper style package. What’s awesome about this colorway is it will be available at your favorite designer art toy retailer! So give them a call today and request this deliciously evil looking figure. 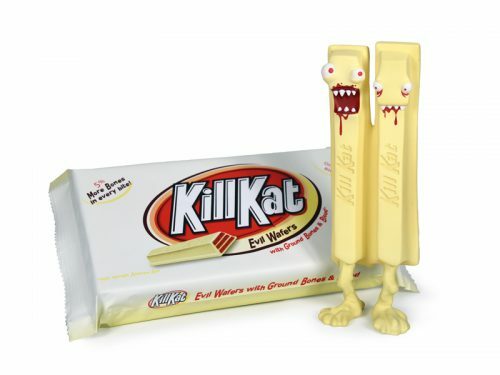 Limited to just 150 pieces, this Kill Kat will retail for $40.